Millions of people suffering from malaria now have new hope after British scientists unlocked the genetic map of the plant used to cure the disease. Scientists from the University of York have confidently predicted they will have high-yielding anti-malaria crops available for wide spread plantation in developing countries within two years. The discovery of the genetic map of the medicinal herb Artemisia annua has been hailed as a significant breakthrough that could save countless lives. Researchers said the new plants they will breed will be given to poor farmers who can use them to grow a cash crop that could help build up fragile economies. The research has been funded by the Bill and Melinda Gates Foundation. 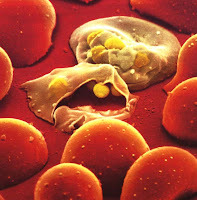 Malaria kills at least one million people every year even though it can be prevented and treated.The most effective drugs to treat the disease are Artemisinin Combination Therapies.More funding has become available to deliver these treatments which are expected to reach 200 million each year by 2012. But there is currently a shortage of the plant Artemisia annua which is a key ingredient in the drugs. The scientists from University of York said they hope to be able to meet the new demand within two to three years. They have published the the first genetic map of this species, plotting the location on the plant's genome of genes, traits and markers associated with high performance in the latest issue of the journal Science. The genetic map will enable scientists to recognise young plants as high performers from their genetics. It will also inform the selection of suitable parent plants for breeding experiments. The map has been confirmed in glasshouse experiments that found the top-performing plants had higher frequencies of genetic indicators for high yield. Professor Dianna Bowles and Professor Ian Graham have led the research project. Professor Graham said: "The map is already proving to be an essential tool for us. "With our new understanding of Artemisia genetics, we can produce improved, non-GM varieties of Artemisia much faster than would otherwise be possible. "This speed is essential. We intend to get high-yielding seed to farmers in the next two to three years in order to supply soaring demand for malaria treatments. "This is a really tight deadline and we can only do it with the benefit of the new knowledge provided by the map." Prof Graham said the work demonstrated how modern genetics has shortened the time needed to turn a wild plant species into a domesticated crop, with the potential to save millions of lives. The scientists will continue to create the new varieties for use by many thousands of small scale growers in the developing world, which is an important source of income. The project has received its second grant from the Bill & Melinda Gates Foundation.